A search on Google for the phrase "what is smartwatch" describes it as "a mobile device with a touchscreen display, designed to be worn on the wrist." It goes on to say that "the main benefit of a smartwatch is that it keeps you constantly updated without you having to whip out your smartphone." Wikipedia describes it as "a mobile device which "consists of a package, including the computer and the display, attached to a bracelet." Lifewire says that "A smartwatch is a portable device that's designed to be worn on the wrist, just like a traditional watch. 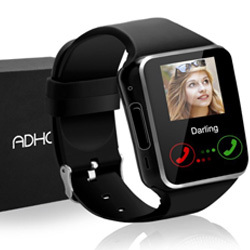 Smartwatches, however, like smartphones, have touchscreens, support apps, and often record heart rate and other vital signs." To me, Lifewire has got it spot on. Their description definitely defines today's smartwatches. There are many high-end smartwatches like the Apple Watch, Samsung Gear S3, LG Watch Style and the Garmin Forerunner 735XT that can cost you anywhere between $230 bucks to $400. If you're a frequent traveler and you want a smartwatch that's affordable then check out these six popular selections that cost under $100. Check out the Best Selling Smartwatches For Women.